ogen and phosphorus slowly. My main worry with a sand based mix was the availability of nutrients, would essential minerals and trace elements be present or will I need to add them? Nutrients would be leached out of the sand mix quite quickly whereas loam holds onto nutrients longer. This is only the first crude test, I am about to pot up a selection of different bulbs into a sand based mix and loam based mixes so I can watch their development through the entire growing year. I will use the knowledge gained from the above experiment and supplement the sand based pot with the correct nutrients. After showing some Erythronium 'chains' in last week's log I found this test pot planted last year. I had removed and split the chain remnants of old bulbs from Erythronium dens canis bulbs and potted them up by themselves - above you can see the results. These have all been stimulated to grow by the removal of the dominant bulb from the chain. Another repeat from last week is a sectioned erythronium bulb. However this happened accidentally when I was repotting this single E. howellii bulb which was growing half in and half out of the pot, in an attempt to escape through the bottom drainage holes. The bottom, small part, has the bud and it will grow on and should flower next year. I have grown this as a single bulb for about eight years with no vegetative increase it will be interesting to see what the larger section does, will it produce a bud? 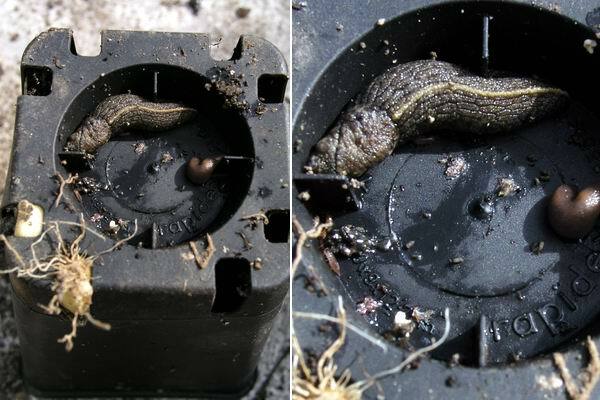 One setback of using some of the tall square plastic pots, is the slug home in the bottom. This make of pot has, for some reason, got a deep depression in the base which makes an ideal cool, damp and dark place for slugs to hide during the day. I always scatter a small amount of slug pellets in the bottom of the frame before I place the pots, this helps keep number of the slimy pests down. Another pest I found in this frame is the wood louse or 'slater' as it is known in this part of Scotland. 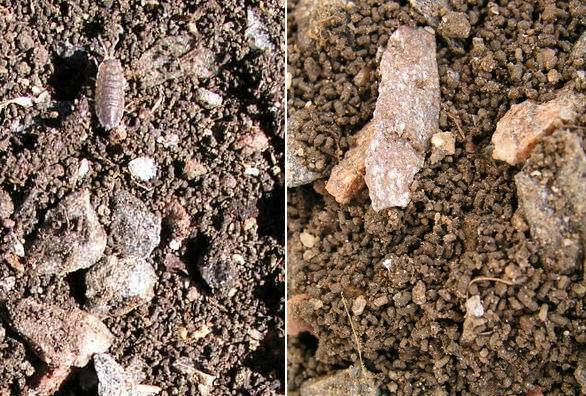 It is not a direct pest as it feeds on dead vegetable matter but it has a detrimental effect on the compost by eating the humus content - the leaf mould - and passing it in the form of miniature pellets as seen in the right hand picture. This destroys the best properties of my compost making it retain too much moisture instead of being free draining. As always, I am fascinated by the form of some of the bulbs when I handle them - I always say that nature buries the most interesting part of bulbous plants. Corydalis blanda parnassica is one of a group of corydalis that have this type of underground structure with a hollow base - they tend not to increase by splitting but just get a little bit bigger each year. I have still a lot of fritillaries to repot and have now resigned myself to the fact that I will not get them all done this year. Fritillaria whitallii is one of the ones that I have done and it is always nice to see nice healthy bulbs with a generous quantity of rice grains - nature's free gift to gardeners. Further to my comments about the evolution of rice grain species in last weeks log, it is without doubt that in gardens rice grain producing frits have a big evolutionary advantage over non rice producing bulbs in that there is always some to share with friends and when you lose your flowering sized bulbs to a rot there are nearly always some rice grains left to continue the genes. A few flowers to enjoy includes this lovely pale blue form of Allium beesianum one of the late summer flowering alliums and named in honour of the great seedsman Bees. 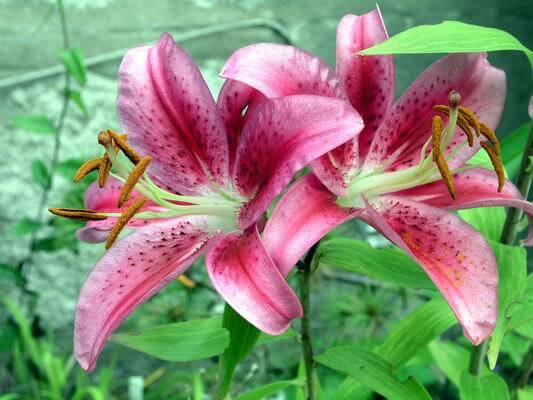 The hybrid lilies are always a delight to see. 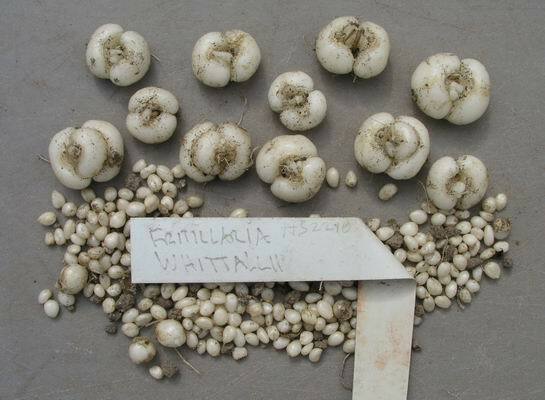 I believe that all bulbs, and especially Fritillaria, have a built in clock / calendar that regulates when the plant will start to break its dormant period - this time window is found in both mature Fritillaria bulbs and also in their seeds. 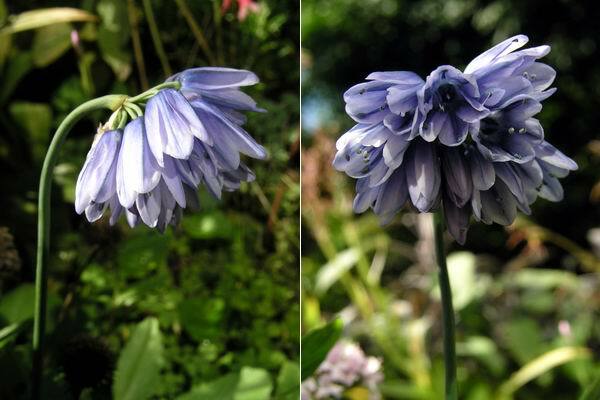 We all know that Fritillaries, like most Mediterranean type bulbs, have a growth cycle that starts in September / October, to coincide with the autumn rains. It is then that the bulbs' roots start to grow and the shoot grows slowly underground through the winter months. By early spring the shoots are just below the surface and they already contain the stem, leaves and flowers, all just waiting for the signal to go into a period of rapid cell growth. Over thousands of years these plants have evolved to respond in this way. They have adapted to make maximum use of what is often a very short period of favourable conditions, to grow, flower and set seed before the hot dry summer conditions prevail. They can achieve this rapid growth by starting to make their preparations before they go into the summer dormancy. 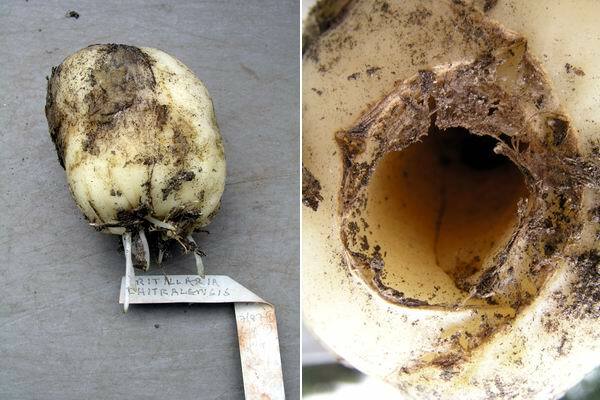 By then, the miniature shoot inside the bulb is already formed, containing the embryo stem, complete with leaves and flowers. The bulb then enters a period of slow growth through the autumn and winter months. As soon as the temperature rises sufficiently in spring, there is a rapid acceleration in the growth, the roots extend further, the shoot grows, the flowers open and then if the plant has been successfully fertilised it sets seed. I believe that it is because they are so conditioned to this cycle that this 'time window' to break dormancy exists. 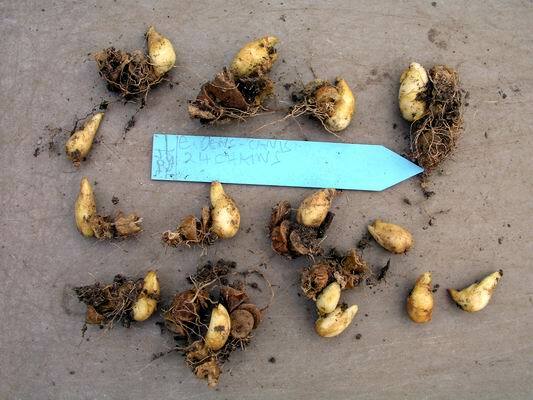 Mediterranean type Fritillaria bulbs start looking for moisture in the period of September -October. It is during this time that their roots start to emerge from the bulb and providing the conditions are suitable, i.e. water is available, the bulb will start to form a healthy root system. If the conditions are not ideal the roots will continue a period of very slow growth waiting for moisture - it is a bit like sticking your big toe in the water before you take the plunge. If the conditions do not improve by December the bulb will abandon root growth and go into what I call 'survival mode'. 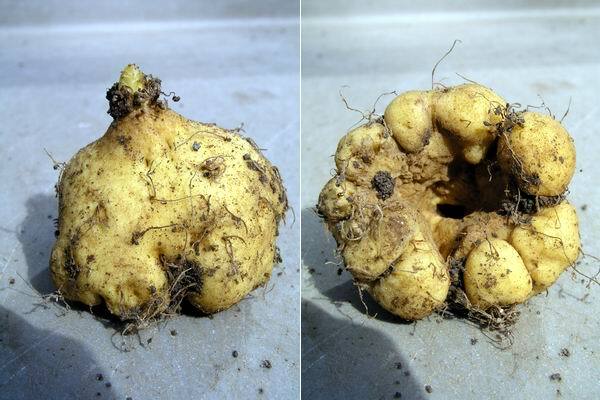 It is not the presence of water that initiates root growth, the roots are already emerging from the bulb at this time, the presence of moisture activates the rapid root growth phase. 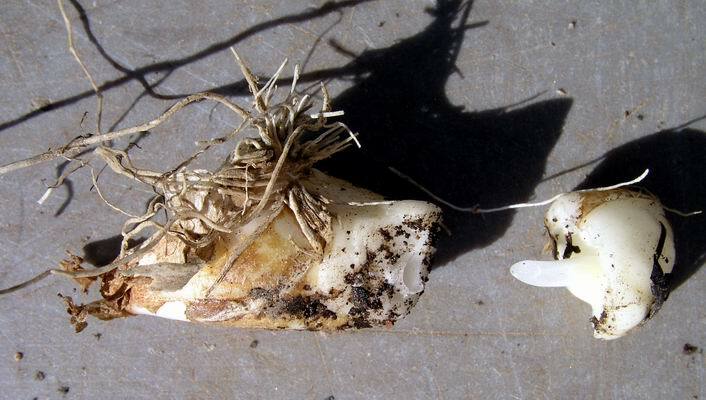 The typical Fritillaria bulb consists of two scales which are replaced annually, they pass their store of nutrients onto the new plant, and a new bulb forms, at the base of the flowering stem; this bulb will take the plant through the next dormant period. However, in 'survival mode', because the plant has no roots and cannot draw up nutrients, the old scales slowly wither away and a new somewhat smaller bulb will form on top. The old scales do not always pass all their goodness on and there is a danger that the old scales can start to rot; this rot can pass onto the new bulb so you need to have a look from time to time and be prepared to remove the old scales from the new bulb to prevent this. Sometimes a bulb in survival mode can even manage to put up a small stem and flower, purely from the stored food in the bulb and without any additional nourishment. I have kept Fritillaria bulbs in dry sand at a stable temperature of between 2-4C in the dark and by December they enter 'survival mode'; new bulbs are forming as the old bulb passes on its store of energy. Rice grains stored in this way also replace them selves with a new rice grain. Many of the Chinese Fritillarias that have come into the UK in recent years have spent their first year with us in survival mode because they arrive in here too late (usually December) for the roots to establish. My suspicion is that the roots were formed some months earlier and were killed off when the bulbs were lifted. While these Chinese bulbs have the same survival mechanisms, they have a different growth period. They seem to look for moisture and form their new roots soon after or even as the plant goes into dormancy in the summer. I am still studying their growth cycle and will write it up at a later date when I have a better understanding of what goes on. The acceleration of growth in the spring is certainly triggered by rising temperatures but the rise does not have to be dramatic. Any one who has grown Fritillarias will know the frustration when your frits are enticed into growth too early in the year by a brief mild period, the effect of which is amplified when the bulbs are grown under glass. This results in plants that are often leggy, due to growing in low levels of light and short daylight hours. The next time window is the dormancy phase when the above-ground growth starts to die back. I have also experimented with this phase of growth by providing ideal growing conditions, (i.e. cool temperatures with plenty moisture and light), to see how long I can encourage the bulbs to stay in growth. No matter what I try I cannot keep the majority of them growing past mid June. 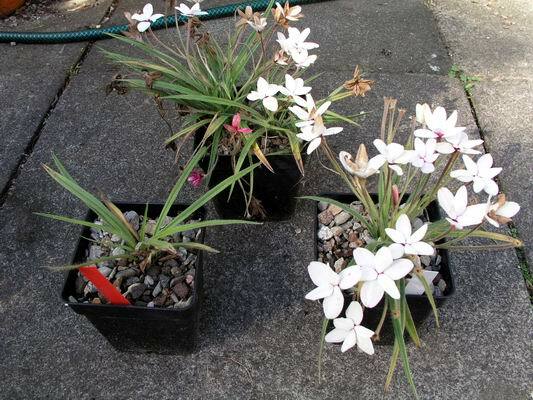 A couple of exceptions are late flowering species like F. pontica and, from North America, F. biflora which do not normally go dormant until July. Fritillaria biflora 'Martha Roderick' has the longest above-ground growth period of all the frits that we grow, often appearing in December and it still has green leaves in July. So I conclude that there is also a time window that controls when the bulbs enter dormancy. Two main factors, temperature and moisture levels, affect exactly when this happens but it always falls in a set time window. Whether a plant is setting seed also affects when it will go dormant - a fertile Fritillaria will grow for a further four to six weeks longer than one that has not been successfully pollinated. You can of course force the plant into 'survival mode' during the growth period by withholding water. When it comes to Fritillaria seed the same autumn time window exists; the ideal time to sow frit seed in cultivation is through September and October. The seed should be sown on the surface of a gritty compost then covered by 1 to 2 cms of grit and watered well - we leave our seed in open frames until germination occurs (usually starting in January) then we move it under glass, this method gives us an even, more or less 100%, germination rate. You can get a reasonable, although more sporadic, first period germination with a November / December sowing, which usually also produces a further germination in the second and third years. I receive a lot of frit seed through the various exchanges that operate around the world, these are usually distributed from January onwards but I never sow Fritillaria seed after mid December. I store this seed in a fridge kept at 2C to 4C (the atmosphere in the fridge is kept reasonably dry by large bags of silica gel) until September when I sow it as described above. This method always gives a more even and better germination rate than I would get if I sowed the seed when it arrives through January and February. I do not lose any growing time as most of the seed would not germinate until the second spring anyway. Now with every theory there is always a catch and the problem I have with my time window hypothesis is that our friends in the southern hemisphere also grow Fritillarias very well. So if this time window is passed on genetically, then the plants must have the ability to adjust their 'clocks' when they go down under and the seasons are turned upside down.